"Director Gerda Stevenson offers something like a master class in how to combine mythical meaning and successful drama, by presenting the three characters in Ellie Stewart’s new play Mischief as richly believable human beings – drawn in large, bold brush strokes, but instantly recognisable…with Stevenson’s strong hand on the tiller, blending music, movement and two languages in a near-perfect balance, this theatrical ship comes home in fine style – grey hempen clothes, Celtic standing stones, and all." The Scotsman. "Gerda Stevenson directs with elan: the staging is slick, simple and imaginative." TV Bomb. 'A stunning elegiac piece of theatre. Weaving lyricism, choreography, sign language and ethereal music…this play is like a little sister to the late Angela Carter, a fragile, sensitive work of sensuality and haunting beauty with a wonderful cast of three. Catch it when it comes to the Traverse in Edinburgh, or later at West Yorkshire Playhouse in Leeds, before it swims away and is gone for good...perhaps'. Across The Arts. 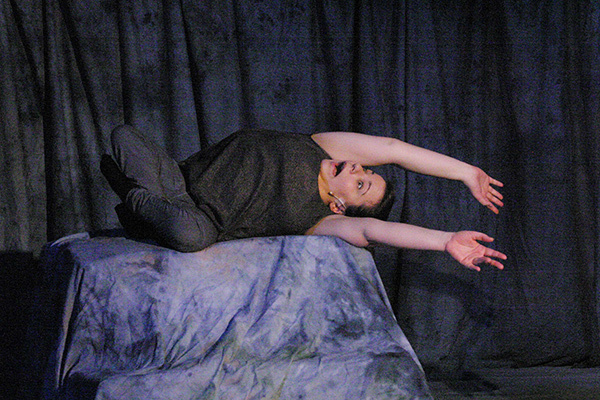 “It’s a strange, visionary story…a wild and fascinating piece of stage poetry. Never to be forgotten.” The Scotsman. “Gerda Stevenson has cleverly put some dramatic meat on the bones of Skeleton Wumman, her reworking of an old folk tale. In doing so she has created a peach of a lead role superbly played by Amy Conachan. Amy gets splendid support from Buchan Lennon who also acts as a signer for the deaf. The ethereal music from Seylan Baxter’s electric cello is the icing on the cake.” Critics’ Circle, Oran Mor, 17 April 2014. “Like a good short story, a well crafted one-act play can offer a narrative as fully realized and, as universally resonant as a full length stage work. Gerda Stevenson’s “Federer Versus Murray” is a case in point. Author Stevenson also directs and plays Flo. Such a hat trick usually fails, lacking an outside eye, but here, it results in an uncommon unity of vision and a completely realized productio." Robert Windeler, Pick of the Week, http://www.ticketcentral.com/ (New York, 2012). “It’s a winner.” THE IRISH EXAMINER, 2011. “…Dave Anderson is superb as Jimmy, a man trying to look on redundancy as a new opportunity, while Stevenson (Flo) is a tightly coiled spring of grief and resentment. Meaty stuff…acute human insight.” "… hilarious and heartbreaking.” **** The Herald (Glasgow, 2010). BRACE POSITION, by Rona Munro. 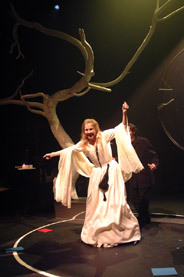 “A formidably well-crafted 30 minutes of theatre...Wendy Seager and Simon Tait give thoroughly enjoyable, high energy performances in Gerda Stevenson's well-pitched production...the result is a surprisingly moving show that cuts straight to the heart of the politics of every family.” Joyce McMillan, The Scotsman, September, 2006. 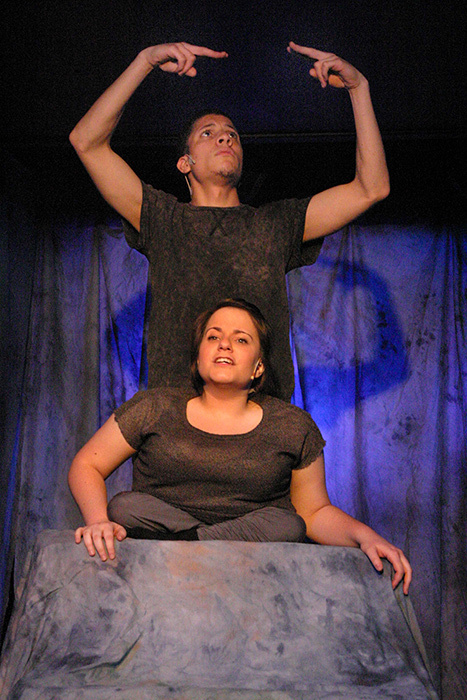 “Taut, fast-moving...Maggie and Mark remain in their seats, with their seatbelts securely fastened, for the whole play. However, director Gerda Stevenson ensures that this is a dynamic show, with character development, emotional journeys and return trips taking the place of physical movement.” Stephen Gray, Evening News, October 2006. 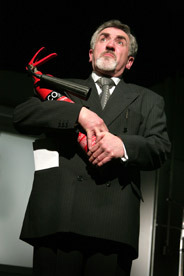 “Set in a plane's cabin on two aircraft seats it could have been a very static piece, but the excellent cast, Gerda Stevenson's intelligent direction and Rona Munro's well packed text have us flying with this brother and sister and re-examining our own relationships and our fears.” EdinburghGuide.com, October, 2006. THE MEMORANDUM, by Vaclav Havel. “Richer than a gag about bureaucracy and language – the further we get into Havel's world of office politics, buck-passing and sackings, the deeper it resonates with us. Stevenson makes it clear that the victor is neither the level-headed Gross, nor his callous rival Ballas, but the system itself.” The Guardian, February, 2006. THE PENTLANDS AT WAR, by the Pentlands Writers' Group. THE PRICE OF A FISH SUPPER, by Catherine Lucy Czerkawska. “Gerda Stevenson's taught production...a powerful insight into post-industrial turmoil. The best in this season (at Oran Mor) to date.” The Herald, March, 2005. “Blisteringly eloquent, full of passion, this is a show that reminds us that for generations of men, the long ritual of letting go of Scotland's macho economic past is still far from complete.” The Scotsman, March 2005. WITHOUT A TRACE, by Carol K. Mack, for Sounds Of Progress. Scotland on Sunday, September 2002. “Stevenson’s staging is the highlight of this production. At first, the setting’s singular combination of mirror, tree and musical ensemble seems not just peculiar, but overtly complicated. But since the subject matter is a pianist who gains her sight but loses her talent, this surreal triptych proves very quickly to be a highly original way of creating visual depth and adding layers of meaning.” Sunday Herald, September 2002. Kenneth Speirs, The Mail on Sunday, September 2002. 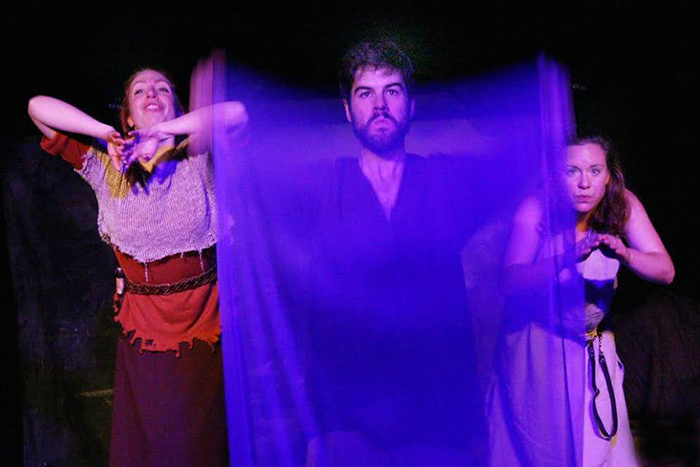 THE GREEN LADY OF BALCONIE, a multimedia community drama, Fearainn Domhnuill Arts. “The Green Lady’s a winner!...queues of people in the street desperate for tickets.....personality and sense of fun bursting through...brilliant...video sequences which were cleverly used not only to provide atmosphere, but in places became part of the set itself, drawing both actors and audience into the play.” Ross-shire Journal. AN TURUS, an opera by William Sweeney, Paragon Ensemble. “...an opera brilliantly of its time. With a minimal set - three panels and a series of ramps, well devised lighting and a wonderfully restrained amount of “business” - Gerda Stevenson’s direction is extremely sure. Transitions (house to moor to wedding to urban mess) happen, as they should, more by inflection in behaviour than by imposed visual cleverness. The characters are well defined and believable.” The Scotsman. THE CRUCIBLE, by Arthur Miller, R.S.A.M.D. “Gerda Stevenson’s production is directed with a sure and confident hand...many moments of real tension and heartbreaking emotion.” The Herald. REFUGE, by Janet Paisley (1996 Peggy Ramsay Award.) Stellar Quines Theatre Co.
“Downright funny…performances of blazing conviction are matched with unfussy, confident direction.” The Guardian. “Director Gerda Stevenson stages the play with raw emotion and down-to-earth humour. One to catch.” The Big Issue. “The most sobering play of the year, produced with no-nonsense honesty by Stellar Quines under the direction of Gerda Stevenson.” The Sunday Times. Critic’s Choice, Scotland On Sunday. 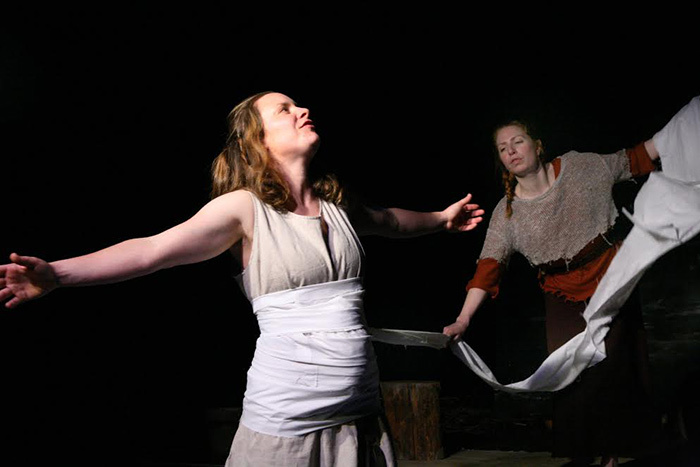 THE SEAL WIFE, by Sue Glover, Stellar Quines Theatre Co.
“Linguistic beauty and sensitivity…vivid and tantalising…Gerda Stevenson’s production is impeccable, played out imaginatively on Karen Tennent’s ramshackle set by a vintage, primarily female cast, which brings a rare weight to the proceedings.” The List.